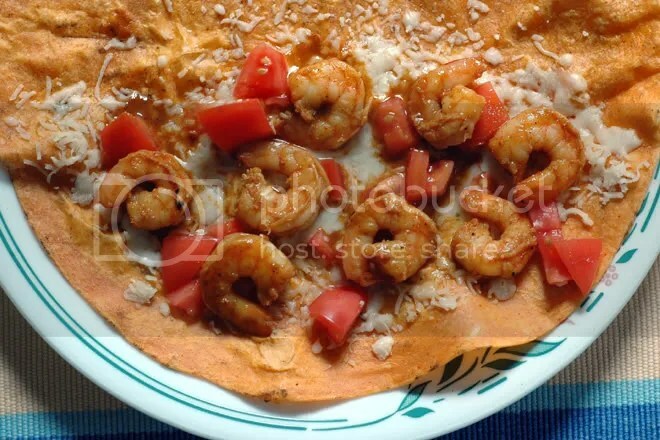 Arun’s Cafe: Serving Shrimp Quesadillas! After a long hiatus this afternoon, Arun&apos;s Cafe opened briefly. Shrimp Quesadillas were on the menu! Mantra for the weekend brunch: Quick and Tasty! These quesadillas were both, and as a bonus, not much cleanup! Tomato and basil tortillas (Wilson Farms) were warmed on a pan, turned, and on one half, I spread a blend of shredded mozzarella and asiago cheese, diced plum tomatoes and shrimp, separately sauteed in malvani masala! Then fold over, cut wedges, and eat, … slowly, completely chewing the food! This looks easy and is definitely mouth watering. Go ahead and try and … be creative and experiment with different ingredients.